Red Heart’s Make It, Wear It, Flash It and Share It Contest. 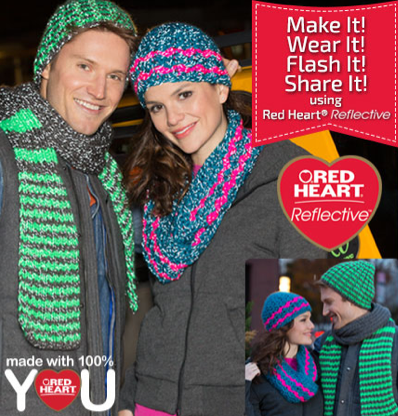 So we all know that the new Reflective Yarn by Red Heart is taking North American knitters and hookers by storm. It’s crazy fun yarn. I just got mine delivered yesterday and I am in love with the colour line itself. Just for kicks, I decided to show off the reflective nature at the coffee shop… YEP… lots of gasping and comments pertaining to it. It’s so surprising to most people. The contest is really easy generally. If you love Pinterest, you will love this contest. There are 4 things in the list to do. Don’t worry, you can do it. Win All of This Yarn by Red Heart! Psst… you could always pin Patterns from Red Heart’s Website as your suggestions too! This contest is being run by Red Heart Yarns. Good luck and happy pinning! This entry was posted in Crochet Challenges, Red Heart Yarns and tagged Contest, Flash It, Mikey, Red Heart, Red Heart Yarns, Reflective, Win, Win It, Yarn. Bookmark the permalink. Not sure how to do the tagging part. Hi, Michael, I really love this site!!! problem: I am looking for a filet pattern, it is a wall hanging, “Wish You Were Here”, the Eifel tower, it is done in filet crochet…Can you help me?